There is a pall hanging over all of our moments these days. It’s the awareness that we are no longer safe. That the ones in danger could be you or me. Maybe at this moment there is not a direct threat on our lives, no bounty hunter coming with our photos in his pocket. But in the world today, not far across the ocean and just to the south, even in our own land, people are running for their lives. Their homes are being taken, their cities and their ways of life. But that’s not all. They’re being cast from their nations, sent into mountains and deserts, many of them to die. Those who cannot escape fast enough are being killed in brutal and horrifying ways. The kind that make your stomach cringe at the thought that maybe, possibly, this could be real. Although you hope to God it’s not. And all the while, as we read of these reports, as we see them on the news, as we avoid searching for them on the Internet because of what we might see, we know that this could easily be me or you. There’s a growing tension I feel, and maybe you feel it too, the tension of enjoying my life and safety when I know others are in harm’s way. I feel a pained gratitude when I drink a cold glass of water, or enjoy food or the closeness of my children. Knowing we all go to bed in relative safety almost hurts. Because what right do I have to live in safety while others perish? They are mothers like me. Who love their children strong, through the night and into the waking mornings, just like me. They fight for their children with fierceness in their eyes, all the while speaking hope, even if it evaporates from their own souls, just like me. They dream of beautiful futures for their little ones, just like me. They have children, just like me. Tiny ones, infants they are still carrying and toddlers who, wide-eyed, do not understand what is happening to their world. But all they see is death and destruction all around. In a moment they were living in safety. In another moment, it was taken from them. In this most hostile of takeovers, the enemy does not fight fair. We felt the pangs of death and evil when the claws of terror landed in our homeland only 13 years ago. Yet how quickly we forgot. We are so accustomed to safety that a matter of years later we have once again lulled ourselves to sleep, a slumber of oblivion. A chosen ignorance, a comfortable naivete. But how can I sleep when she could be me? 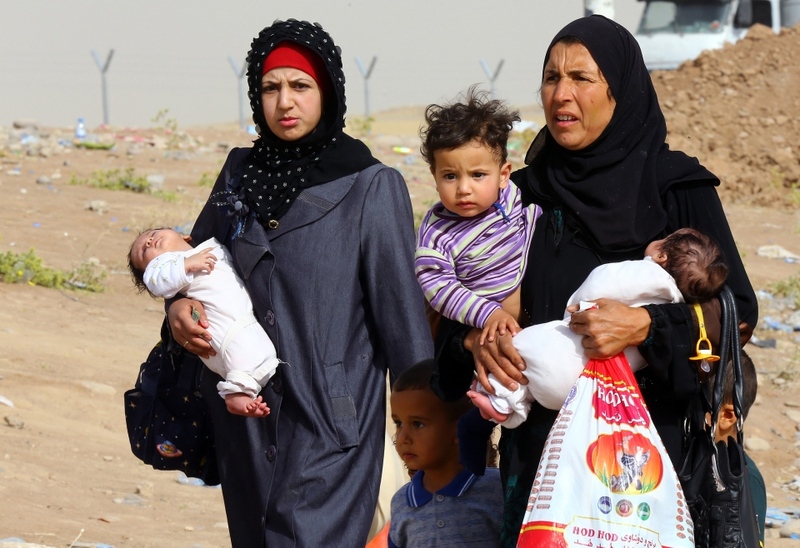 When she, the one who grasps her children under her arms and flees for her life, could be me? How can I rest comfortably when she, who helplessly longs to offer her children food and water, but has none, could be me? This isn’t happening only in Iraq, but this crisis there has woken me up. When I learned of Meriam and her imprisonment with her two children, I woke up. In the middle of the night, I woke up to pray. And I find myself doing this again. Because these mamas with their babies could so easily be me. All of a sudden the wars of distant lands are coming home. Because I am a mother just like them. I feel helpless and terrified. My brows furrow and my heart sinks under the weight of this horror of humanity. What can be done? I ask myself. What can be done for those were just like me? The first thing we can do is pray. But let’s not pray any old prayers, helpless shotgun prayers from our cars while we drive, a few words rung out of oursouls before we forget them again. And then I look up to see if God will show me his view. If he will tell me what he wants to do and how he plans to heal. If I don’t pray God’s prayers from God’s view, I will steep in hopelessness and despair. I won’t want to raise my children in this evil world. But I’ve read the Bible and evil does not triumph. Death is NOT the end of the story. This loss and heartache, while it wrenches my gut with its presence, is not the final chapter. Yet we must do what we can. So we pray from their eyes and God’s eyes. And we give. We give until it hurts. We give up our comfort foods and rituals and hours, and we exchange them for prayer. Our acts of fasting and generosity are an expression of solidarity with the poor, the downtrodden, with the horror-stricken mamas and daddies and babies. If you want to dig into your pockets, and I strongly commend you to do so, to answer the call to heal the world with what is in your wallet, then here is a reputable organization to whom you may give: World Help. Today I gave enough for two refugee children to have food and medicine for a month. I want to give more, and I may be able to in the future, but today, I gave for two children because I am a Mama of two boys, and I would want a Mama-with-enough to share with me if she could. I can. So will you pray and will you give? Give for your children, for your grandchildren, your nieces and nephews. Pray and give as if the lives of your precious loved ones depended on it. Because they do.